Family-friendly pro wrestling debuts in Clemmons, NC featuring Tommy Dreamer & the Stars of AML Wrestling. CLEMMONS, N.C. - July 24, 2016 - PRLog -- Fans of AML Wrestling have been nomadic in 2016, as the renowned & fast-growing promotion has sought to expand its reach. 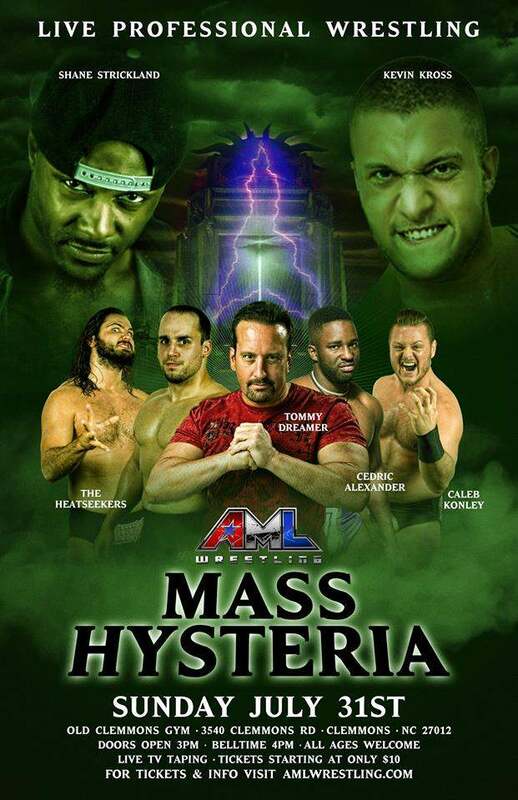 This continues on July 31 when AML Wrestling comes to the Old Clemmons School Gym in Clemmons, NC for their Mass Hysteria event featuring former ECW Heavyweight Champion Tommy Dreamer & the Stars of AML Wrestling. The card is going to be action packed, with two titles up for grabs & MUCH more. To say Cedric Alexander's star is on the rise is an understatement. The man who calls himself "The Best in the World" earned a golden opportunity to prove it, as he recently competed in the WWE Cruiserweight Classic. In June, Alexander (with manager Tommy Thomas) won the AML Prestige Championship tournament. At Mass Hysteria, he will defend that title against Lucha Underground competitor Shane Strickland. Strickland, known as Killshot in Lucha Underground, is a high flyer with a daredevil streak. He is arguably even quicker than his opponent. Alexander boasts a considerable size advantage (Strickland is 5-9 and will weigh in at around 170 pounds), but if Strickland can keep the pace fast & keep the champion in space, anything is possible. As always, Tommy Thomas's presence at ringside will loom large & could swing the battle one way or the other. Two of the most violent men in the sport will be forced to go "extreme" on July 31 when Damien Wayne & Zane Dawson are joined by former ECW Champion Tommy Dreamer in a triple threat No DQ match. Dawson & Wayne have been feuding for months, with Dawson winning tainted victories involving the interference of Dawson's mentor George South that have sent the newly dubbed "The Unpredictable One" over the edge. The violence has escalated & so has the rhetoric. George South expressed on AML television recently that he no longer can control the "One-Man Riot", while Wayne has promised revenge, requesting that AML beef up its security, as it is unlikely that the Old Clemmons School gym can contain the battle. Throw in the Innovator of Violence Tommy Dreamer into the mix is akin to throwing a powder keg into a bonfire. Will Damien Wayne finally overcome the numbers game & defeat Dawson? Will Dawson win & put himself right back into the AML title picture? Or will the ECW Original emerge victorious? We will find out July 31. The HeatSeekers' (Sigmon and Elliot Russell) stranglehold on the AML Wrestling Tag Team Championship will be challenged July 31 when they finally face the Geordie Bulldogs (Sean Denny and Mark Denny) for the titles in Clemmons. Both Denny brothers have been hospitalized after attacks by the HeatSeekers; Mark Denny has recently been cleared by AML medical staff after sustaining a neck injury during an interview on AML television, & Sean Denny expects to be cleared after sustaining a leg injury during the Prestige tournament. The Bulldogs are certainly motivated, & the HeatSeekers have certainly been dominant since they won the championship months ago. The champions are certainly the favorites here, but it would be a mistake to underestimate the British brawlers. Caleb Konley will be facing one of the toughest matches of his career when he faces "The Tollman" Kevin Kross in Kross's AML debut. Konley is well known to AML fans as one of the most versatile wrestlers in the region. In Kross, Konley will be facing a physically imposing force (6-4, 270 lbs) with a reputation for injuring his opponents. Konley will have to adjust his style, but so will Kross, as the quicker Konley is likely to try to keep the bigger man in space. This represents a unique challenge for both men. Two men who last faced off in the finale of the AML Prestige Championship Tournament will face off one on one July 31. Former AML Wrestling Champion Caprice Coleman will collide with the man who calls himself "Picture Perfect," Jordan Kage. Coleman was able to get the best of Kage during the Prestige tournament & both men want another title shot. Coleman will rely on his high flying ability & his mat wrestling, while Kage will want to turn this into a fight. Whoever wins this match will likely lay claim to another Prestige title chance. The AML Tag Team division will show some of its depth July 31 when The Dixon Line (Ken Dixon and Joe Keys) battle Team Axcellence (Axton Ray and Brandon Scott) in a match that will likely see the winner challenge for AML Tag Title gold. Ken Dixon is coming off an impressive victory over "Brutal" Bob Evans in High Point, while partner Joe Keys wrestled in a losing effort in the Prestige tournament (along with Ray and Scott). Both teams want to be in the title picture, but they have to face each other at Mass Hysteria. Both King & Black had impressive showings in the Prestige Championship Tournament. The winner of this match could prevail as a favorite to challenge for the Prestige Championship. As we go to press, tickets are still available! This event is in a more intimate venue which puts the fans closer to the action so it is expected to sell out. Head over to the tickets section at AMLwrestling.com and secure your seat today! Doors open at 3pm for row 1 & 2 ticket holder, 3:30pm for everyone else and the opening bell is at 4pm at the Old Clemmons School Gym located at 3540 Clemmons Road in Clemmons, NC 27012. You do NOT want to miss it!